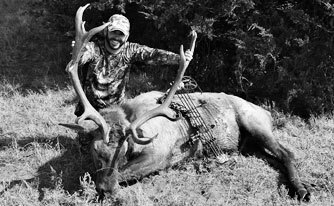 No Mercy Hunting Services, Oklahoma Hog Hunts, Exotics, Elk and More! Welcome to No Mercy Hunting Services, L.L.C. We strive to provide the highest quality hunting experience for you. We are located in Caddo County in Southwestern Oklahoma. 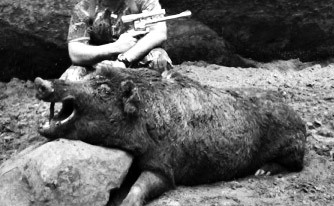 Hog Hunts are our specialty and is how we got started. We have been growing ever since and now offer a variety of hunts on thousands of acres of prime hunting ground. We offer the opportunity to see Oklahoma wildlife in its native habitat and the friendly service you deserve on your hunt. Oklahoma Hunting has something to offer for every hunter. We offer fair chase species such as whitetail deer, wild hog, turkeys, dove and prairie dog and preserve hunts for whitetail, elk, buffalo and exotic species such as fallow deer, axis deer, sika deer, many exotic ram species, aoudad, blackbuck, etc. The variety of hunts we have to offer separates us from many other hunting lodges. We strive to provide the highest level of service in the industry. Whether you chose one of our hog hunts or one of our most expensive exotic game hunts or elk hunts, we will provide you with friendly service. We hope to provide you with a level of service that we believe you just won’t find at many other places. 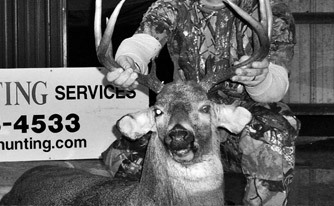 Many of our customers have been hunting with us since we started offering hunts over 10 years ago. We believe that is a testament to our level of service and the quality of the experience we offer. We offer fully guided and semi-guided hunts for many native and non-native species. Whether you’re looking for a trophy deer, meat for the freezer or just a fun get away with friends we have a hunt for you. We can tailor a hunting package to whatever combination of hunts you desire. We can combine one of our hog hunts with an exotic hunt, elk hunt, or whatever you desire. We will work hard to meet your needs and expectations. Come join us for a great hunt the No Mercy Way.